Have you ever dreamed of performing in front of your family, friends and a whole auditorium of people with a professional orchestra? See last year’s winner Dallas Noble. 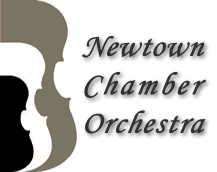 The Newtown Chamber Orchestra can make your dreams come true! Qualified students are encouraged to audition for the unique opportunity of performing with the orchestra as a guest soloist at the April 14, 2018 concert. Winner will also receive a monetary award sponsored by Dr. Peter Sinaiko and Ms. Linda Sandler. While we wish we could provide this fantastic opportunity to every interested student, only one will get that chance after auditioning with senior members of the orchestra. If you think you have the right stuff, please consider auditioning. Please give us a call at 267-291-4626. Please select one piece of the Recommended Repertoire for your audition.You must provide your own accompanist. If you need an accompanist, call 215-598-9072 for information.